U.S. M1 Abrams tanks withdraw to a safe position after mortar rounds landed nearby in Kufa, Iraq, on April 29, 2004. Editor's note: This article was corrected after publication. An earlier version incorrectly said the Pentagon spends $3 billion every 82 minutes. The Pentagon actually spends $3 billion in a little more than a day. Also, the earlier version said that members of the House Armed Services Committee got $31,500 from General Dynamics during a two-week period in September last year. The correct figure is $30,500. The M1 Abrams tank has survived the Cold War, two conflicts in Iraq and a decade of war in Afghanistan. No wonder – it weighs as much as nine elephants and is fitted with a cannon capable of turning a building to rubble from two and a half miles away. Its proposal would idle a large factory in Lima, Ohio, as well as halt work at dozens of subcontractors in Pennsylvania, Michigan and other states. Opposing the Pentagon’s plans is Abrams manufacturer General Dynamics, a nationwide employer that has pumped millions of dollars into congressional elections over the last decade. The tank’s supporters on Capitol Hill say they are desperate to save jobs in their districts and concerned about undermining America’s military capability. So far, the contractor is winning the battle, after a well-organized campaign of lobbying and political donations involving the lawmakers on four key committees that will decide the tanks’ fate, according to an analysis of spending and lobbying records by the Center for Public Integrity. 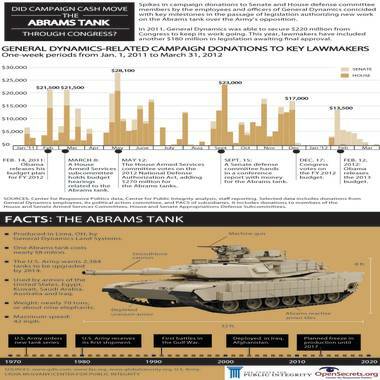 Sharp spikes in the company’s donations – including a two-week period in 2011 when its employees and political action committee sent the lawmakers checks for their campaigns totaling nearly $50,000 – roughly coincided with five legislative milestones for the Abrams, including committee hearings and votes and the defense bill’s final passage last year. The cash and the tank. Click to enlarge image. It already has more than 2,300 M1’s deployed with U.S. forces around the world and roughly 3,000 more sitting idle in long rows outdoors at a remote military base in California’s Sierra mountains. The $3 billion at stake in this fight is not a large sum in Pentagon terms – it’s roughly what the building spends in a little more than a day. But the fight over the Abrams’ future, still unfolding, illuminates the major pressures that drive the current defense spending debate. These include a Pentagon looking to free itself from legacy projects and modernize some of its combat strategy, a Congress looking to defend pet projects and a well-financed and politically savvy defense industry with deep ties to both, fighting tooth-and-nail to fend off even small reductions in the budget now devoted to the military – a total figure that presently composes about half of all discretionary spending. In the last decade, however, as hundreds were deployed to Iraq and later Afghanistan, a key shortcoming became apparent: Their flat bottoms made the Abrams surprisingly vulnerableto improvised explosive devices (IEDs). As a result, the Abrams in Iraq ended up being used as “pillboxes”— high-priced armored bunkers used to protect ground. “The M1 is an extraordinary vehicle, the best tank on the planet,” Paul D. Eaton, a retired Army major general now with the nonprofit National Security Network, said in an interview. Since the primary purpose of tanks is to kill other tanks, however, their utility in modern counterinsurgency warfare is limited, he added. 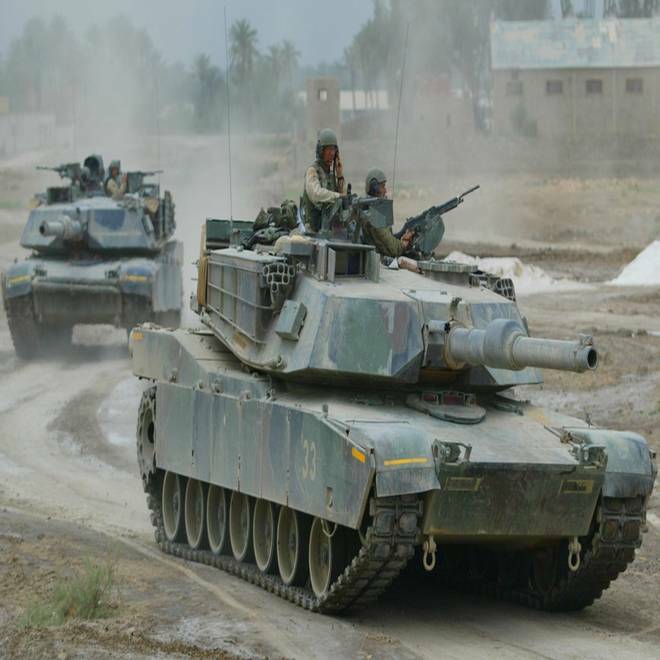 Ashley Givens, a spokeswoman for the Army’s Program Executive Office for Ground Combat Systems, said that the Army can refurbish all 2,384 tanks it needs by the end of 2013. Freezing work after that, she said, will allow the Army to “focus its limited resources on the development of the next generation Abrams tank,” rather than building more of the same that “have exceeded their space, weight and power limits." For example, when House Armed Services Committee member Hank Johnson, D-Ga., held a campaign fundraiser at a wood-panelled Capitol Hill steakhouse called the Caucus Room just before Christmas last year, someone from GD brought along a $1,500 check for his reelection campaign. Several months later, Johnson signed a letter to the Pentagon supporting funding for the tank. Johnson spokesman Andy Phelan said the congressman has consistently supported the M-1 “because he doesn't think shutting down the production line is in the national interest." The contribution was a tiny portion of the $5.3 million that GD’s political action committee and the company’s employees have invested in the current members of either the House and Senate Armed Services Committees or defense appropriations subcommittees since Jan. 2001, according to data on defense industry campaign contributions the Center for Public Integrity acquired from the nonpartisan Center for Responsive Politics. These are the committees that approve the Pentagon’s spending every year; without their support, the tank – or any other costly military program -- would be dead. But Pease denies trying to time donations around key votes, saying that the company’s PAC typically gives money whenever members of Congress invite its representatives to fundraisers. “The timing of a donation is keyed by (members’) requests for funding,” he says, adding that personal donations by company employees are not under his control. He said the donations tend to be clumped together because lawmakers often hold fundraisers at the same time. During the current election cycle, General Dynamics’ political action committee and its employees have sent an average of about $7,000 a week to members of the four committees. But the week President Obama announced his defense budget plan in 2011, the donations spiked to more than $20,000, significantly higher than in any of the previous six weeks. A second spike of more than $20,000 in donations occurred in early March 2011, when Army budget hearings were being held. At a March 9 hearing of the House subcommittee dealing with land forces, Rep. Silvestre Reyes, D-Texas, railed against the Army’s decision to freeze work on the Abrams. Since the start of 2001, Reyes has received $64,650 in GD donations, including $1,000 on March 10, the day after the hearing, according to the data. Reyes office did not return a request to comment; his overall campaign receipts in the current election cycle have been $1 million. Another large spike occurred the first two weeks of May 2011, a period in which the House Armed Services Committee voted 60-1 for a budget bill containing money to continue work on the Abrams through 2013. Over this period, GD’s PAC and employees donated a total of $48,100 to members of the four committees, with almost $20,000 of that going directly to members of the House Armed Services Committee as they voted. The workforce “is not like a light switch. You can’t just click it off, then walk away for three years, come back and click it on,” Pease said. Smaller suppliers who exclusively make parts for the Abrams could be shuttered if the Army’s spending stops, he said. GD has also accused the Army of underestimating the plant’s temporary shutdown costs, claiming that the government’s actual savings would be minimal. GD paid the Podesta Group nearly $1.7 million since 2009 to lobby on the defense appropriations and authorizations bills, according to lobbying disclosure forms. Among the more than 20 Podesta lobbyists assigned to the account was Josh Holly, communications director for the House Committee on Armed Services under Republican leadership for six years. According to Holly’s bio on the Podesta website, he worked directly with Republican Buck McKeon of California, its current chairman. McKeon is a major recipient of GD campaign donations, garnering $68,000 from GD’s PAC and employees since the start of 2001 — with $56,000 of that coming just since 2009, when he became the committee’s top Republican. Holly did not respond to emails and phone calls seeking his comment and committee spokesman Claude Chafin said McKeon has consistently argued that it is fiscally smarter to keep the Abrams work going than to stop it. Podesta also assigned the GD account to two former House Appropriations Committee aides. One of them, Jim Dyer, confirmed that he lobbied on the tank this year, but directed other questions to General Dynamics. GD also hired firms that assigned its account to six other lobbyists who worked for the relevant committees and to a former Pentagon liaison to Congress. Of the 173 signers, 137 received contributions totaling more than $2 million from GD since 2001. Giving to Republicans and Democrats was split in half, with Republicans receiving about 51 percent of contributions, and Democrats 49 percent. More than half of the Armed Services committee and defense appropriations subcommittee members signed, effectively telgraphing the outcome of their deliberations. The first signature was from Rep. Sander Levin, D-Mich., whose district includes the Detroit suburb of Sterling Heights, the location of the headquarters for General Dynamics Land Systems. Rep. Levin’s brother is Michigan Democrat Sen. Carl Levin, the powerful head of the Senate Armed Services Committee. Sen. Levin has received $46,200 from General Dynamics since 2001; his brother has received $43,000. In a written statement, Rep. Levin said he wants to protect the Abrams because it is of “vital importance to more than 60 local companies” in Michigan and the difficulty of restarting tank production after a hiatus. Rep. Levin’s spokesman Josh Drobnyk says Levin has not conferred with his brother on the issue but confirms that representatives from GDLS contacted the congressman’s office about the Abrams. Both this year and last year, the funds were added to the President’s proposed budget without a specific recorded vote, in what independent experts have termed an earmark — money directed by members of Congress to a pet project that often benefits their district. Earmarks were supposed to have been banned after the 2010 election, but lawmakers have decided that when multiple members favor adding funds – rather than just one lawmaker – it is not formally an earmark. If it does, the fight still might not be over. The White House, in its May 15 responseto the House budget, objected to the “unrequested authorization” of funds for the Abrams during a “fiscally-constrained environment.” The administration did not specifically threaten a veto over the issue but said that if too many unrequested projects impeded “the ability of the administration to execute the new defense strategy and to properly direct scarce resources,” senior advisors will recommend the president veto the bill. The Center for Public Integrity is a nonprofit, independent investigative news outlet.